List of queues for the call center. List of call center agents. Agent With Least Talk Time: Rings the Agent will ring that has the least time talking. Agent With Fewest Calls: Agent will ring that has the least calls. Longest Idle Agent: The agent will ring who idles the longest depending on their tier level. Ring All: All agents ring simultaneously. Random: Rings Agents will ring randomly in not particular order. Ring Progressively: Agents will ring the same as top-down and will progress until each agent ends up ringing. Round Robin: Will ring the next agent available in line. Sequentially By Agent Order: Agents will ring in a sequence by the tier and the tiers order. 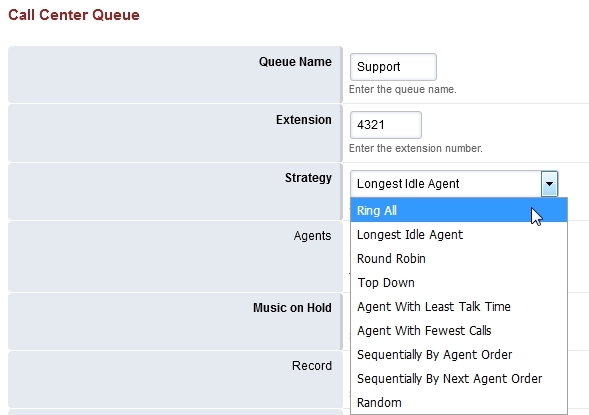 Top Down: Agent rings in order starting from one. Select agents from the drop down list and specify tier level and tier position. Select the desired hold music. Music on hold, streams and ringtones can be used. Queue: Caller in queue time will start. If the caller goes to another queue the time will start over. System: Caller in queue will have their wait calculated as soon as they enter the system. If a caller chooses the wrong queue, when they get to the correct queue the timer won’t start over again. A value of 0 is the default and equals an infinate amount of time. Any other numeric value is calculated in seconds. Enter the max wait time with no agent. FusionPBX sets the default to 90 seconds and the Timeout Action will be used if there are no agents available. Enter the max wait time with no agent. FusionPBX sets the default to 30 seconds and the Timeout Action will be used if there are no agents available. Set the action to perform when the max wait time is reached. True: Set the tier rule rules apply to true. The defined tiers will be used. False: Set the tier rule rules apply to false. All tiers will be used. 30 seconds is default. Enter the tier rule wait seconds. True: The amount of seconds the caller waits until the next tier. This value will increase(multiply) if Tier Rule Wait Multiply Level is marked true. False: Tier Rule Wait Multiply Level is marked false then after the set amount of seconds pass the tiers in order will execute with no wait. Default is 900 seconds. Sets the discard abandonded after seconds. True: Setting is enabled. Permits a call to resume their posistion in the queue but only in the amount of seconds set in discard abandonded after . Set a prefix on the caller ID name. A sound to play to a caller every announce sound seconds. Needs the full path to the .wav file. How often the announce sound is played in seconds. Keys to quit the current queue waiting. Enter a description to help organize and define what the queue is for. Agents can login to call center with *22 from the phone or via the FusionPBX web interface. Admin and Super Admin accounts can also log other agents in or out.